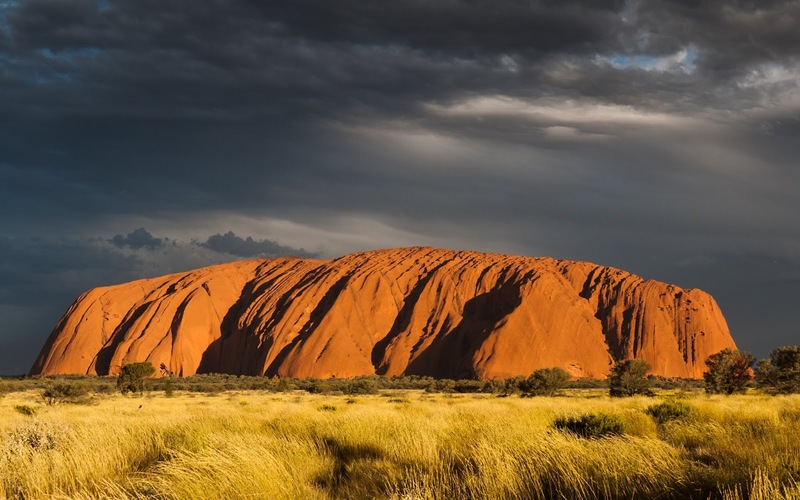 The biggest single rock in the world is Ayers Rock (also called Uluru) in Northern Australia. Ayers Rock is a monolith rising 1,142 feet (348 m) above the stony desert and 2831 feet (836 m) above sea level. It is 5.8 miles (9.4 km) around. It is still often debated that Mt. Augustus is the biggest rock but this mountain is a monocline (rock still connected underneath) whereas Ayers Rock is a monolith (not connected to anything). Many people think rocks are uninteresting. After all, they just sit on the ground. But if you are a geologist or an amateur who collects rocks specimens from their natural environment, then they are a treasure. Kids love collecting rocks for their unique shape or shiny qualities. Prospectors look for valuable minerals and gemstones such as gold or diamonds. Most rock collectors love gathering rocks and minerals for their beauty. However some rocks, like Ayers Rock, are just too big to collect. This huge stone is made mostly of feldspar and quarts (two common minerals) with a small amount of other rock fragments. All rocks are made of very durable materials. Big rocks are much better for purposes other than collecting such as providing shelter, a foundation, or defense. Huge rocks have been used for centuries by humans. The Bible has a lot to say about rocks. Large rocks were used as land marks such as the rock of Rimmon (Judges 20). A rock provided water in the wilderness (Numbers 20:10). Sacrifices were offered on alters built by stacked stones. Rocks also provided shelter in the form of caves (Judges 15:8). The tomb of Jesus was cut from the side of a rock (Matthew 27:60). Rocks are durable and strong. They seem to last forever. That is why God is often compared to a rock in the Bible. Just as it says in the key text, our God is like a large mighty rock. He is impenetrable and will not be destroyed or over come. He will provide shelter from storms and our enemies. We can stand firm on the Rock as our foundation. Ayers Rock may be the biggest rock on earth, but our God is the biggest Rock in the universe. He is able to withstand anything. How big was the biggest rock you have ever seen? How did that rock make you feel? Are rocks something we can trust in? In what ways? Do you trust in God in the same way? 1. Kenneth Pletcher, "Uluru/Ayers Rock," Encyclopædia Britannica online, last modified September 12, 2018, https://www.britannica.com/place/Uluru-Ayers-Rock.